Why else would you come to a Shrimp Festival on the beach? 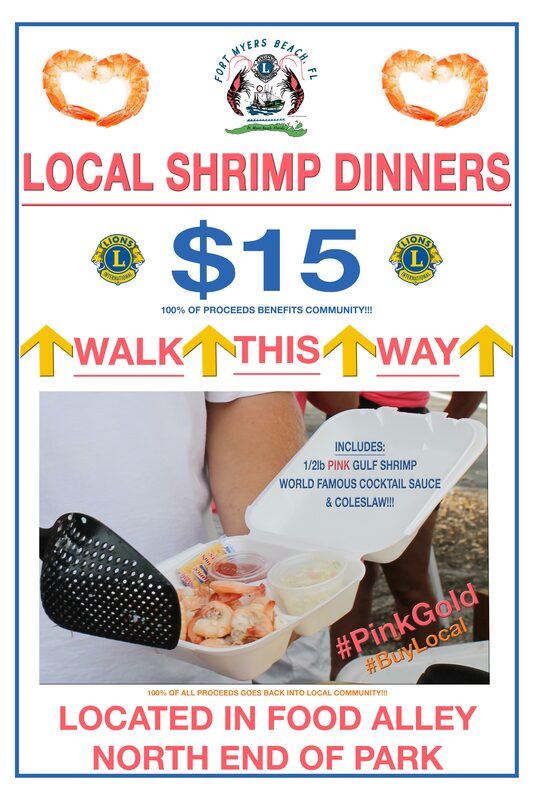 The Fort Myers Beach Lions have been boiling and serving delicious Gulf Pink Shrimp to festival attendees for over fifty years! The secrets of perfectly cooked ‘peel and eat’ shrimp have been passed from boil master to boil master through the years, as well as the secret recipe for Lions delicious cocktail sauce served as an accompaniment. It all starts; of course, with the finest shrimp the Gulf can offer. Delivered straight from the Fort Myers Beach Shrimp Boat Fleet (see photo on left),the Gulf Pink Shrimp is unsurpassed in flavor and versatility. 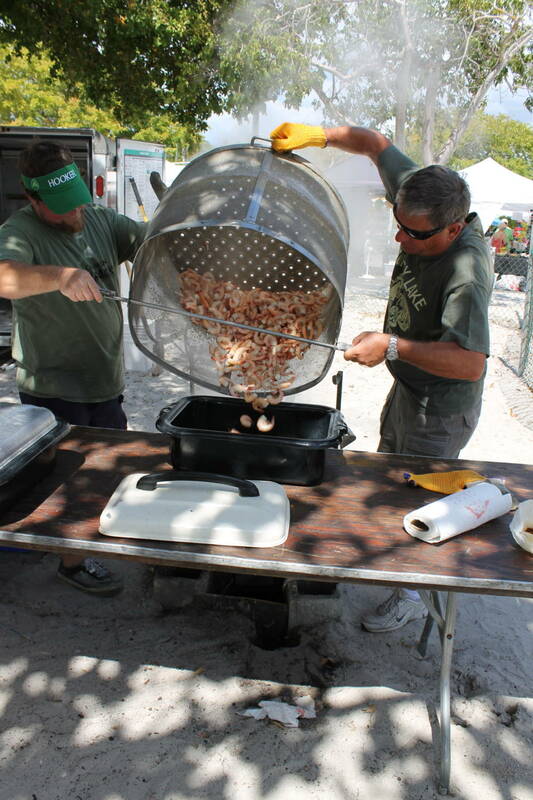 Beach Lions serve over one thousand pounds of the fresh local sweet pink crustaceans every year, making the Shrimp Boil one of the main attractions of this annual festival. Lions toil and boil for two days, from 10 until six, to bring the goodness of the Gulf directly to the savvy folks in the “Shrimp Line”. Following the two-hour beach parade Saturday morning the line forms for the best and freshest food that southwest Florida had to offer. One half pound of steaming shrimp is served on every plate, accompanied by sauce and slaw. While they are there Festival goers also take the opportunity to browse and buy from the 100 beach crafters and vendors who have made this event one of the best beach festivals in the South and a mecca for tens of thousands of visitors each year. On the way through the festival there’s usually some music to enjoy, a collectable Official Festival tee shirt, hat or tank top, an opportunity to watch the crowning of the next Shrimp Festival Queen, and a huge selection of other eating and entertainment opportunities. What better way to spend a Saturday or Sunday afternoon than enjoying shrimp at the edge of the Gulf of Mexico and dipping your toes into the sparkling sea too? 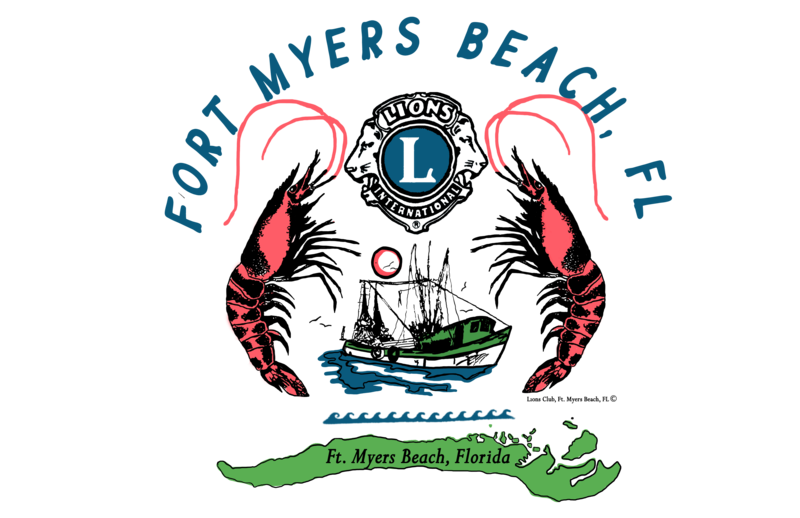 Many people come both days just for the shrimp boil, which is testament to the goodness dished out by the Fort Myers Beach Lions. A better shrimp dinner cannot be found! While Bubba Gump may be able to cook shrimp in a variety of ways, the Fort Myers Beach Lions excel in the pureness of boiled shrimp. After all, this is the SHRIMP festival!